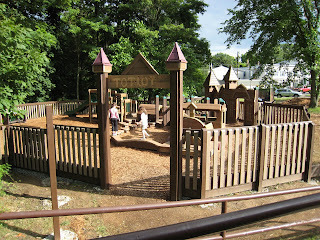 Four days after the PA3 volunteers helped build the tot lot in Hopewell, I showed my kids the PA3 handywork. Note that the wall shown in the top picture in the next blog (I am the orange-clad builder on the right) is now mostly buried by 12 inches of mulch. My kids loved playing there. I am so impressed by this playground that I am scheduling a PA3 Little Tigers Playdate on July 19th, 10:00 - 11:30 AM at this tot lot. It's located at the old train station, across from 27 Somerset Street, Hopewell, NJ. 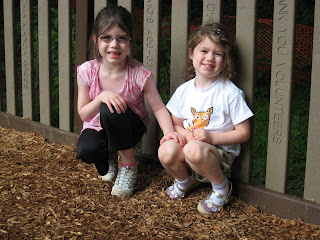 Kudos to Rachel Beatty Riedl *09 for organizing the playground project and to the many volunteers! Check our facebook page for more photos. "We are excited to announce that Isles has been chosen to be a 5% Day recipient of the Whole Foods Market in Princeton (3495 US Route 1 South, Princeton, NJ 08540). Once per quarter, Whole Foods Markets throughout the country contribute 5% of one day's sales to a non-profit group. Isles' 5% Day at Whole Foods will take place on Tuesday, June 23." So shop on Tuesday if you can! Buy Buy Buy! I am proud to celebrate my brother, Christopher R. Beha, and the publication of his first book, The Whole Five Feet. Please join me in welcoming Chris to Princeton for a reading and reception. Chris majored in English and did a creative thesis at Princeton. While he was a senior and the VP of Tiger Inn, he was diagnosed with Hodgkins Lymphoma. He is witty and charming, and his readings are really fun and funny - a great mix of high and low. His twin brother, Jim '02, was an officer at Cottage. I, Alice (Beha) Teti, was in the class of 2000, and my husband was '99. My dad, Jim Beha, was class of '71. We all figure in the story. 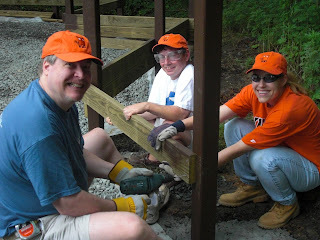 Community Service June 20th – Build a Playground, Get a Hat! Help build a playground – and be among the first recipients of our brand-new, high-quality, tasteful-orange, PA3-logo-embellished, volunteer-appreciation baseball caps! On Saturday, June 20, from 8:00am-12:00noon, PA3 members and their families and friends are invited to be part of the effort, coordinated by Rachel Riedl *08, to build a playground in Hopewell Township. Jobs are available at a range of skill levels, from novice to expert. Children are welcome; child care will be provided for ages 3-9, children 10-13 may work with a parent, and ages 14 and up may work independently. Volunteers are asked to check in at the gazebo in Gazebo Park, 1 Columbia Avenue, Hopewell NJ, 08525, at the corner of Columbia and Greenwood Avenues. Please identify yourself as a PA3 volunteer so you’ll be directed to the location where our group will be working. Be sure to sign up in advance at www.hopewellplayground.com/form.php so we’ll know who’s coming, and so you’ll receive parking information, updates and reminders. 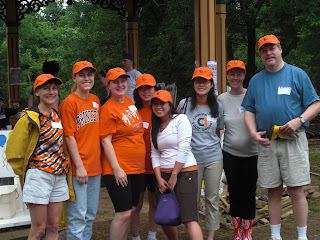 Please include “PA3” in the suggestion box at the bottom so Rachel can identify alumni volunteers. You are welcome to sign up for any and all shifts – but the morning shift on June 20 is where you’ll meet up with fellow alums and get your hat. In recognition of the PA3 Community Service Committee's work to promote community spirit among area alumni, the Alumni Council awarded us a grant to fund the purchase of the hats. A condition of the grant is that we provide photos of hat-clad alumni at work on group projects, and this event will be our first opportunity to display our spirit in living color. If you wear orange gear too, so much the better. We hope to see you in Hopewell! Questions? Contact Rachel Riedl at rbeatty@princeton.edu or Arlen Hastings at hastings@ias.edu.